Hello and welcome to another tutorial of Tik Tik Host. In this tutorial, you will learn how to buy your first domain - step by step and how to create subdomains by using your primary Domain. The Basic Requirement Before Buying a Domain. Now, if you are sure about your email address, then let's continue to our tutorial. How to Buy Your First Domain - Step by Step Tutorial. To purchase your first domain name, visit our website at Tik Tik Host and select to Domain option in the Menu Bar. If you have already selected your domain name, then enter your desired domain name in the search bar. In this tutorial, we're going to buy mywebyguide.com domain name. Let's check it out whether it is available or not. Great! In the above image, it is showing that our desired domain name is available. 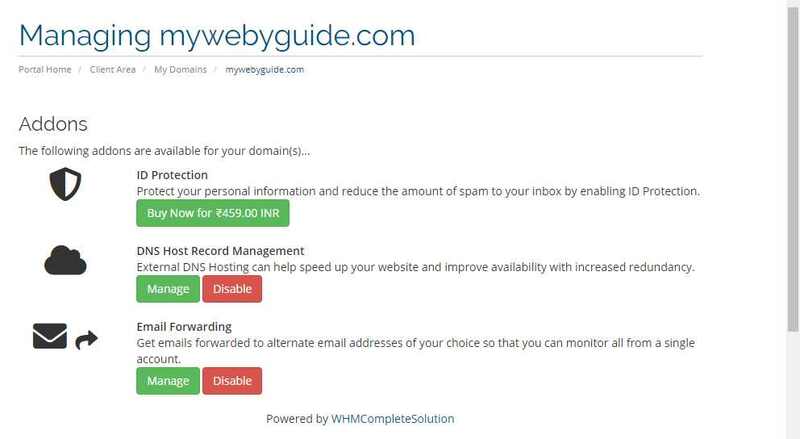 So now, we are going to order our mywebyguide.com If your domain name is not available in .com TLD, you can select other domain TLDs like .net, .org, .in, etc. To know more about more TLD's availability Click Here. [Note: we highly recommend you to buy a .com TLD, if you have any confusion or want our experts to advise you, then you can initiate chat anytime by Clicking Here. Our domain experts team will help you to search for an exclusive KeyWord Domain Name for you. Now, If you have selected your domain and added it in your cart, select your desired addon option and scroll down to check your nameservers record. For this tutorial, we are going to add some free addon services like DNS Management Addon & Email Forwarding Addon services. In this image, it is showing that the DNS Management & Email Forwarding addon services are free, But the ID Protections addon is a paid service, unselect the box if you don't want to purchase ID Protection for your Domain Name. Most of the time, we offer DNS Management Addon & Email Forwarding Addon free, but sometimes these options are also payable. We highly recommend you to review our latest exciting offers on Domains by Clicking Here. Once you selected your desired addon services, scroll down the page and re-check your nameservers. Your nameservers should be the same as it is shown in the image because we offer free SSL Certificate as we have partnered with LetsEncrypt. Also, you have the option to change/select currency options as per your choice for this tutorial we have chosen the Indian currency payment option. If you have selected your choice currency option, then click to Continue Button. Now in this step, you can see the domain price for 1 year is INR 862 and in the checkout option, it is showing INR 396. It is because we have applied a promo code in our cart. That's why we highly recommended you to check our Latest Offers on Domains to avail discounts. In this step, you need to enter your correct personal details. However, you can also create your account through facebook login, google login, and through twitter sign in option. But, if you are registering your domain for the first time at tik tik host you need to mention your personal details very thoroughly and scroll down the page. Once you scrolled down the page, you will see additional information is required to register your domain. For your domain registration, you can submit another personal information, or you can continue by selecting Use Default Contact option. Please make a note to secure your account you need to generate a strong password so that no one can access your account except you. To create a strong password Click Here or enter your desired password. Once you generated strong password select your payment gateways. We have two payment options, and you can pay us through PayPal or Instamojo. Both the payment gateways are highly secured. For this tutorial, we are using Instamojo Payment gateway. Now scroll down the page, tick the box to accept the terms and conditions and click to the Complete Order button. Once you click the Complete Order button, you will receive an Unpaid invoice. This is a pre-generated invoice, so that your can review your complete invoice. If there is no changes in the invoice, Click the green color Proceed button to complete your payment transaction. 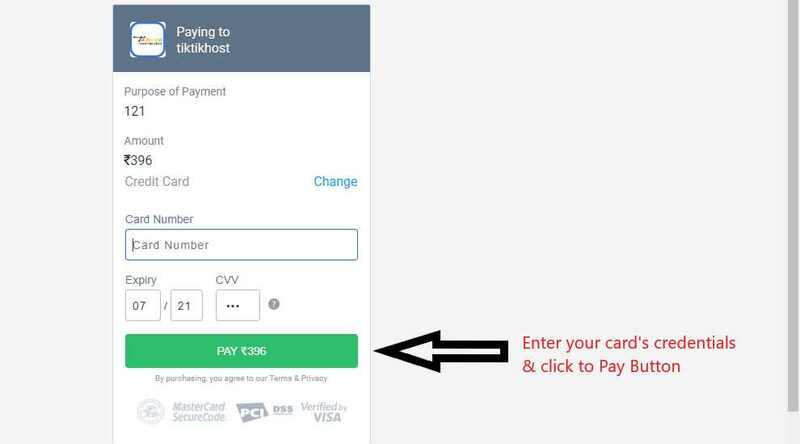 Now, once you click the proceed button you will be redirected to the payment gateway option. Through Instamojo payment gateway you can complete the payment transaction through various options. 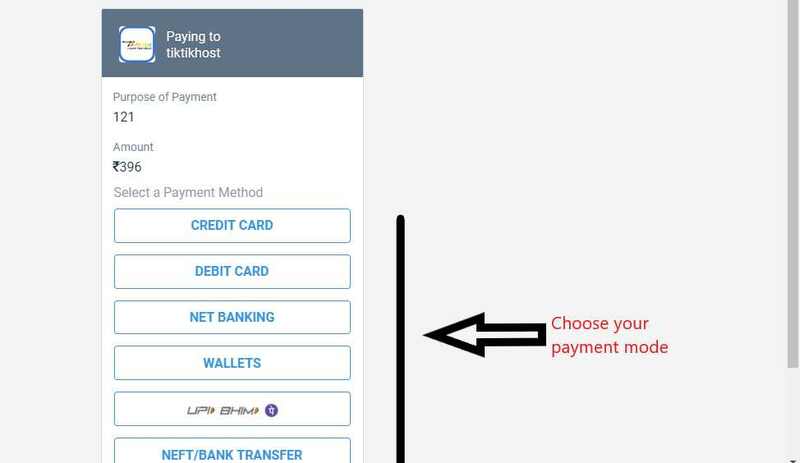 For this tutorial, we are using the Credit Card payment option however, you can choose any of the other options. Once you click the domain tab button, you will be redirected to your domain's dashboard option to manage your domain account. Now, to check and manage your Domain's setting click the Active button. Click on each tab and review your domain details. Also, click the Addon button to review our additional Domain options. Once you clicked the Addon button, you will be redirected to your addon services page. From here you can manage your addon services. If, you have not purchased the addon services, you can come and purchase the addon services from here. Once you verify your account/credentials through the verification link, you will automatically receive a popup as shown in the below image. If you see this, then congratulation to you! Your domain purchase procedure is complete and now you're the proud owner of your domain name. Once again Thank You so much. I am Jay. If you have any difficulties to understand this tutorial, feel free to initiate Live Chat Support. Our support team is 24/7 available to assist you in each step. If you like this tutorial please give a thumbs-up!